As Mississippi’s special election runoff drew to a close on Tuesday, FiveThirtyEight editor-in-chief Nate Silver tweeted that “someone should primary [Cindy] Hyde-Smith, who’s up again in 2020.” Hyde-Smith won by just 8 percentage points in a state that is 15 points more Republican-leaning than the country as a whole1 — this was a pretty close margin for a Republican in a state as red as Mississippi. That makes Hyde-Smith look vulnerable, and the Mississippi GOP has a deep bench of potential office-seekers who could be gunning for her seat in 2020. Alas, we don’t yet have any polling for Mississippi’s eventual Senate primary — or most 2020 races, for that matter. However, we do have a new poll breaking down possible matchups in the 2020 Massachusetts Democratic primary — and it is eye-opening. If incumbent Democratic Sen. Ed Markey faces a primary challenge, the University of Massachusetts Amherst found that he could be in a close race if he’s opposed by either of two notable Democratic names: Massachusetts Attorney General Maura Healey or Rep. Seth Moulton. In fact, Healey held a 1-point lead over Markey, while Markey led Rep. Seth Moulton by 4 points. Now, we are talking about one poll of a race that is still two years away, and, unsurprisingly, it showed that many voters were undecided, so we shouldn’t read too much into this. But to find that a relatively popular incumbent senator is potentially vulnerable to a primary challenge is striking. Markey has only been in the Senate since he won a special election in 2013, but he’s been in Congress since the 1970s. Considering Democratic primary voters unseated long-time Rep. Mike Capuano in Massachusetts this cycle, the Democratic electorate’s desire for fresh faces — and Markey’s bad polling numbers, assuming they don’t improve — could encourage someone to challenge him in 2020. Whether or not that someone ends up being Healey or Moulton remains to be seen. Healey may prefer to run for governor in 2022 and Moulton could be a presidential aspirant. Which senators struggled in their 2014 primaries? Primaries were counted as contested only if two or more names appeared printed on the ballot (write-in candidates were disregarded). The other four incumbents up who faced primary challengers in 2014 won roughly 80 percent of the vote or more. But that 60 percent mark is notable because once you get below it, you start getting into competitive territory for a two-candidate race. Sens. Lamar Alexander and Pat Roberts, who both won their primaries despite pulling in a hair under 50 percent of the vote in 2014, benefited from multi-candidate fields that fragmented the vote to some degree and made it harder for the opposition to consolidate behind a single candidate. And in South Carolina, where a candidate must win at least 50 percent of the vote to win a primary, Lindsey Graham only avoided a runoff by a relatively slim 6-point margin. His night-and-day shift on President Trump may reflect his eagerness to survive another GOP primary. Sens. John Cornyn and Mitch McConnell won somewhat more comfortably, but as party leaders — Cornyn is the Republican party whip and McConnell is the party’s Senate leader — both of them (and especially McConnell) bear the brunt of the public’s dissatisfaction with Congress. To differing degrees, all five appear interested in running again, so a tough slog to win renomination could be in the cards. And who knows which other races might become competitive — after all, Markey didn’t have an opponent in his 2014 primary, but he could be vulnerable this time around. Few could have foreseen Rep.-elect Ayanna Pressley’s win against Capuano in Massachusetts or Rep.-elect Alexandria Ocasio-Cortez’s victory over Rep. Joe Crowley in New York. In theory, Markey could be the victim of one of the next cycle’s primary upsets. In the aftermath of the midterms, the Pew Research Center found that few people expect either party to get much done in Washington. Nearly two-thirds (63 percent) of respondents said they expected President Trump to be unsuccessful in getting his policy goals enacted, and 61 percent said the same thing of Democratic leaders in Congress. Just 9 percent said that they expect relations to improve between the two parties, while 90 percent said relations would remain the same or get worse. According to another Pew poll, Americans — particularly Democrats — find it increasingly hard to talk about politics with people they disagree with. Overall, 57 percent of Democrats and people who lean Democratic said that it is “stressful and frustrating” to discuss the subject with those who don’t share their views, while 49 percent of Republicans and people who lean Republican answered the same way. Republican sentiments haven’t changed much on this question in the past two years, but Democratic frustration has ticked upward since March of 2016, when it hovered around 45 percent. YouGov found that 38 percent of Democrats think Nancy Pelosi should be the next Speaker of the House, while 27 percent wanted someone else. Another 23 percent weren’t sure and 12 percent didn’t care. On the policy front, the American public remains very unhappy with health care, particularly the cost of it, according to Gallup. Almost four in five Americans — 79 percent — are “dissatisfied with the total cost of health care” in the U.S.
After an alarming government report on climate change was published the day after Thanksgiving, a YouGov survey found relative bipartisan agreement that the Trump administration will not take the findings in the report seriously. Overall, 65 percent of Americans, including 77 percent of Democrats and 51 percent of Republicans, did not think the White House would take the report seriously. Just 14 percent of respondents felt the administration will take it seriously. President Trump’s approval rating is 42.4 percent, according to our tracker. His disapproval rating is 52.6 percent. That makes for a net approval rating of -10.2 points — a little under 1 percentage point worse than last week’s rating of -9.4 points. 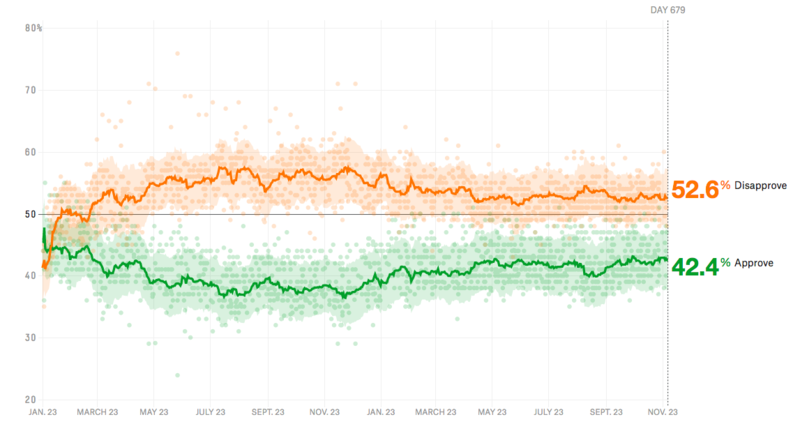 One month ago, Trump’s net approval rating was -10.5 points (42.4 percent approved and 52.9 percent disapproved). According to FiveThirtyEight’s partisan lean metric, which is the average difference between how a state votes and how the country votes overall, where 2016 presidential results are weighted 50 percent, 2012 presidential election results are weighted 25 percent and results from elections for the state legislature are weighted 25 percent.